Stanford, where we first built and sold mattresses back in 1971. Making sleep, part science… part art. It’s been an interesting journey. First the store on University Avenue in Palo Alto while still working on my Poly Sci / Social Thought and Institutions degree (which I am pleased to inform the reader I am proud to have put to use as four-term Mayor of Fort Bragg, California). After that… I am repeating what we said on the history page. Opened a waterbed store in Palo Alto, California as a means to pay for college. Formed FloCare National, providing specialized home delivery and warranty service for Sears, JCPenneys and regional specialty stores in 10 states. SoundSleep, a FloCare subsidiary, began supplying JCPenney and other retailers with high quality softsided flotation sleep systems. FloCare added hard to find/fit replacement part sales direct to customers of national retailers’ and regional waterbed chains. We put our new hospital mattress on the Internet. . Soon we were shipping our components around the world. Designed a latex mattress to provide dual adjustable firmness. Introduced our “90 Night Test Rest” SATISFACTION GUARANTEED OR YOUR MONEY BACK! Built the DreamMaker, allowing users to configure the “Bed of Your Dreams” online, creating “The First Personally Crafted Mattress” – A mattress that is built to order for the specific requirements of each sleeper and shipped within days. My dad, my boss, and for the past 16 years, the Mayor, or city council member of our small coastal town, Fort Bragg CA just hung up his suit and tie and retired from his service to our community. Sure, he’ll still have his hands in many projects, such as the Noyo Center for Marine Science, he’s the president of Fort Bragg Rotary, but for the most part, he’ll just be my dad and my boss again. Sharing my dad with our city has had its ups and downs, but I wouldn’t change a thing. For 16 years, I’ve watched as he shaped dreams into reality, stood up for people with no voice, stood up to people with loud voices, and always kept his voice, the voice of reason, truth, and the voice in his heart of hearts that he knew was right. My dad is not your average business owner, he’s not your average mattress maker, in fact he’s not your average anything, because everything he does, he does 110%. If you take a look at our customer reviews, even our policies, such as the goldilocks guarantee, you’ll see my dad shining thru, he cares about . . . people, he wants to “do what’s right” for the customer, for the homeless, for fellow members of our community. And you can bet, thats how he’ll be remembered in our city, and the mattress industry alike. Our biggest competitor in the bed business saw me at a trade show once, and old guy who had known my dad for years, he introduced himself, I was taken back, “He said, tell your father I said hello, and make sure you listen to him, he’s always wearing the white hat.” I could really go on and on, but perhaps I can sum it up with this. On December 10th, my fathers last council meeting and 67th birthday, the city proclaimed it “Dave Turner Day”! Who gets something like that? Dad invented the “Original Personalized Latex Mattress” 22 years ago, lead FloBeds to become the leader in Talalay latex mattresses online and off-line and taught the FloBeds team to provide the best customer service in the industry, for the last 16 years he has also lead the City of Fort Bragg to be the greatest little city in the world. City Clerk June Lemos put together a slide show for dad’s last meeting. …Dave Turner was recognized by Congressman Jared Huffman … Turner received a congressional records statement – something that is entered into the congressional record – honoring his years of service. Lindy Peters, in one of his last acts as mayor, read a proclamation declaring Dec. 10 Dave Turner Day. Many at the meeting wore shirts with Turner’s face on them that said “Dave Turner Day.” The proclamation cited Turner’s work on the mill site, the Coastal Trail, the successful Georgia Pacific/Office Max litigation, the Noyo Center for Marine Science, the Downtown Streetscape Project and more. Fittingly, Dec. 10 is Turner’s birthday. Turner was first elected to the council in 2002, then re-elected in 2006, 2010 and 2014. Dave served as mayor from 2004 to 2006 and from 2010 to 2016. He served on the city’s Finance and Administration and Public Works and Facilities committees as well as several ad hoc committees. He also served as the city’s representative to the Fort Bragg Fire Protection Authority and Mendocino Solid Waste Management Authority. What’s with all these Mattress Review Sites and how do they get paid? I got into the mattress business while a student at Stanford University in 1971. It was supposed to be a summer job…but that’s another story. Back then, like now, there were businesses that would say or promise anything to get a sale. They usually sold really cheap products for as much as they could get. Twenty years ago we started selling our Latex Mattresses on the “World Wide Web”. It turns out it is a great marketplace. We provide lots of information and images to anyone who is interested. And we customize every mattress for every customer. We guarantee each sleeper will get the firmness they needed. Or their money back. For the next 18 years we enjoyed competing in the “new” Internet space. Other companies copied our design… but that’s to be expected with such engineered comfort. Some used similar quality latex and sold through stores for $1,000 to $2,000 more. Others used inferior foams and sold for less. No one matched our customer service. And our business grew steadily. 1) “Our One Perfect Design fits everyone”– this buy the the dominant online store that now has 3 models, and has discontinued that “perfect” original one. 2) “All Natural” — except for this, that and oh yeah, that too. 3) “Designed by a Rocket Scientist” — it worked for Tempurpedic, why not try it? 5) “Trust Us” — yeah, right. We are lucky to have 20 years of satisfied customers who are repeat customers and tell their relatives and friends about FloBeds.com. Our business will hold steady through these “Mattress Wars”… and after the shake out… our name and address will be the same. FORT BRAGG, Calif. — FloBeds.com stands out in mattress cyberspace with a service-oriented, customized approach to better sleep, one that is powered by Talalay latex. The company, with roots that go back to the glory days of the waterbed industry, was a pioneer in the online bedding arena, which it entered before the turn of the century. Bedding innovator Dave Turner turned to the World Wide Web way back in 1995, when he put a pressure-relief waterbed mattress online, hoping to draw the interest of hospitals and health care facilities. A few years later, tired of dealing with truck lines that couldn’t provide quality home delivery of his beds, Turner designed a foundation system that could be shipped via UPS. With that product, the company could ship a complete bed via UPS in “four manageable boxes,” Turner said. Yes, the company was a pioneer in the boxed bed category, too. Turner, who entered the waterbed business in 1971 as a summer job, found his career instead. “Here I am still in the bedding business, much to the chagrin of my Dad,” Turner said in an interview with Furniture Today. “He wanted me to be a lawyer like him.” But the challenges of running a retail business won out over a legal career. Talalay latex “delivers a unique buoyant but conforming quality that relaxes muscles and relieves tension, lifting away the pressures of the day while you sleep,” the retailer says. FloBeds, which began selling Talalay latex online in 1997, now offers only that material to its customers, fashioning it into its FloBed, available in a variety of feels. It has been selling Talalay latex exclusively since 2005 and offers products in both natural and blended versions. The company says it offers a wide range of Talalay latex mattresses, starting with some with super-soft convoluted foam toppers, and providing five core options. FloBeds’ unique VZone layer features six zones that can be configured in any way the consumer wants, using firm, extra- firm, medium or soft latex panels that are interchangeable. As part of its commitment to customer service, the company will offer any latex zone panel for no charge in the first 100 days, giving consumers the chance to dial in a different feel. FloBeds has a showroom at its Fort Bragg headquarters but sees most of its customers in cyberspace. When you’ve been selling online for more than two decades, that adds up to a long list of satisfied customers, the company says. Pacific Gray Whales are migrating north right now—and maybe you should too! As you might know, Flobeds is located in Fort Bragg, CA, a small town nestled between the redwoods and the sea in Northern California. We would love to invite you to join us in celebrating Fort Bragg’s 36th Annual Whale Festival, which honors the migration of the Gray Whale all the way from Baja back to its ancestral feeding grounds in the Bering Sea. It’s the perfect excuse for you to heed nature’s call and get moving, migrating up or down the coast of the Pacific Northwest to spend the weekend in Fort Bragg, California this March 16th – 18th. Flobeds is a proud sponsor of the Noyo Center. In honor of the whale festival, we are offering a five percent discount and a matched donation to the Noyo Center when you purchase one of our personally crafted latex mattresses with the code WHALE (enter on FloBeds Cart page above “Noyo”). Want to try out the mattress while you’re in town? Several inns and B&Bs on the coast carry our beds, so you can sleep on it before you buy it. Otherwise, stop by our showroom on Redwood Avenue or visit our website to learn more. But do you really need an excuse to marvel at one the earth’s greatest creatures? Come join us to celebrate the Gray Whale in Fort Bragg, California! Bryna Turner grew up in Fort Bragg watching her dad, mom, and three siblings follow their various, varied, surprising dreams. She followed hers down equally divergent paths to find success as the twenty-seven-year-old author of a lauded New York play, Bull In A China Shop, heading for Chicago in May, and playing in Mendocino this summer. Lincoln Center of the Arts awarded the coveted Emerging Artists Award for 2018 to Bryna, one of only eleven artists in the country to earn the honor. When my dad was growing up, he thought he wanted to be a lawyer like his father. And yet, he was always thinking up and executing business plans. He ran a paper route so well he quickly began subcontracting neighborhood kids to work for him. He started a backyard circus that cost a nickel for entrance, and then ran the grill himself, making a killing selling hotdogs. He was a young inventor too—he made a small device to electrocute his brothers who had their own weapons of choice—Andy’s throwing knives and Scott’s blow dart. By the time he was studying political science at Stanford University, he had no plans to go into business. But when he walked into a summer job at a waterbed store only to have the owner call him from Mexico offering to sell him the business at cost, Dave Turner knew he had to seize the opportunity. Almost forty years later, my dad has taken the business through many iterations. It has transitioned from a waterbed store, to a wholesale mattress delivery operation, to what it is today: a business making high-end customizable latex mattresses. But no transition was as dramatic as the decision to move from the Bay Area to Fort Bragg, California. As the youngest of Dave and Anne Turner’s four children, I’ve often wondered: why in the world did they do it? “We wanted to raise our children in a community,” Dave says. “Katie and Dewey were about to enter middle school, and we didn’t want them going to schools with metal detectors,” Anne says. The truth is: my dad was born in Fort Bragg, CA and he wanted his kids to have access to the same kind of small town childhood he enjoyed. And once back in Fort Bragg, my dad returned to one of his own childhood hobbies: inventing. Within a few years, he’d developed a patent for a hospital bed. Eager to get the idea out into the world, but reluctant to leave his family for long periods of time peddling the product on the road, he turned to a brand new technology in 1995: the internet. perfect for individuals. Today, the Flobed is one of the most customizable mattresses on the market. And it’s all made here in Fort Bragg, California, making it one of the only local manufacturers left on the coast. My dad’s business ethos is surprisingly simple: “everyone is built differently; your mattress should be too.” But his attention to difference, his insistence on listening to what each person needs and not trying to solve individual problems with a one-size-fits-all solution—that’s the key to his and my mother’s parenting too. Or, at least, it’s the only answer I can come with to explain how different each of us four kids have turned out to be. Take my sister, Katie Turner-Carr, for example. Like our father, her entrepreneur spirit started young—with lemonade stands, and a keen sense of business. But it was our mother’s footsteps she thought she’d follow in. 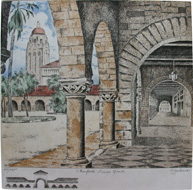 Anne Turner graduated with a degree in fine art from Saint Mary’s College of Notre Dame. Her life plan was simple: “I was going to be a painter who lived alone. And drank a lot.” Instead, shortly out of college, she met my father. She already had a boyfriend; he asked to be her friend. Three weeks later, he proposed. “I just have to break up with my boyfriend,” she said. Thirty-eight years of marriage and four kids later, my mom has cycled through a few art forms. She worked with acrylic paints—until she had my brother, Dewey, who bit through the paint tubes. So she switched to weaving—until she had my brother, Patrick, who took a scissors to her loom. She had taken her first quilting class while pregnant with me, and so when we moved to Fort Bragg, California, she was thrilled to find the local quilting group. Now she’s been a quilter for twenty-seven. She was the featured artist at the local quilt show in 2013, and has taken home dozens of ribbons through the years. People’s Choice is her favorite category. Bragg, California. My father was skeptical. Would a community as small as ours sustain such a business? He imagined the majority of her business would be tourists. She imagined the opposite: locals. “Everyone needs socks,” she said. Why Fort Bragg? Her reasoning wasn’t too different from my parents, back in 1992—she wanted start both her business and her family in a community. So in 2006, my sister returned home to start the next chapter of her life. Her first store was twelve by fourteen feet carved out of the front of the Flobeds building on Redwood Avenue. Because the store was so off the beaten path, all of her customers were locals—and the business flourished. By 2008, she was able to move to Laurel Street, right n the middle of downtown, where she remains today. And by 2009, she and her husband, Marshall Carr, had started their family. And her art? My mom thinks Katie has merged the two passions: “It’s a study in color, just walking into that store.” Plus, she’s busy working on two other masterpieces at the moment: her daughters, Rowan and Zoey, ages 8 and 6.
he was a rebellious high school basketball star who couldn’t wait to get out of town. doing. But the first fire he lit was closer to home: our brother, Packie. Dewey made the Varsity team. At the age of nine, he started studying Dewey’s games. He practiced dribbling one hundred times with each hand, daily. He and Dewey convinced my dad to lay down cement in part of the backyard, making a half court for them to practice. Packie was outside nearly every day, practicing his three point shot. By high school, he was a two-time league MVP. He went to college on an athletic scholarship, and was on a team all four years. So, we were all surprised when, after college, he announced he wanted to join the bed business. He had developed a mattress topper in one of his business classes, and he had a business model that looked pretty good. He knew the industry, and knew he could use a few of my father’s suppliers. He and his wife, Bianca, moved back to Fort Bragg to start their company, Bed Bandits. But to support them while the business was starting, Packie also continued his constant side business: training kids in basketball. It was this side business that eventually changed Packie’s life. One of the kids he trained in the Bay Area went away to a basketball camp—and his skills blew away the other trainers. The next thing Packie knew, he was being headhunted by the camp. But he wouldn’t be won so easily: “They wanted me to sign a non-disclosure, non-compete contract, and I said, look: you didn’t invent the game of basketball. I won’t sign that.” Meanwhile, he continued trying to make his mattress topper business take off. That is, until he got the next call: to help train Steph Curry. Now, Packie is a full-time professional basketball skills trainer. His clients range from five year-olds to NBA starters. He just opened up his own gym in the bay area, where he and his wife live now, and he sometimes travels with a few of his top clients. He’s had to leave the mattress business to the professionals—Flobeds absorbed the topper business. As for me, I might seem like the family outlier. I’m the only one of the four kids who hasn’t yet moved home and attempted to run a business. In fact, after practically growing up inside the family business, I was very determined never to go into business for myself. So, I studied the exact opposite: theatre. There’s nothing less profitable in the world than theatre, which almost always runs at a loss. And, because of how time-consuming it is, you’re almost always losing money while you’re doing it. Plus, it’s horribly temporary. You’re basically making a product that costs more than most people are willing to spend, only reaches a very limited group of people, and then disappears. It’s the world’s worst business plan—and one of the world’s oldest art forms. I didn’t think I’d become a playwright. I thought maybe I’d be an actor. Then I realized that was a lifetime of waiting for someone else to say yes to you. So, I thought maybe I’d be a director. Then I realized I wasn’t very interested in where everyone was standing. I even tried my hand at sound design, listening to the same two seconds of material hundreds of times before I finally gave in to the inevitable: I’m a writer. I’ve always been writing, privately, while acting publically. Finally, I put the two together and discovered—I was horrible at it. Not good at all. But I really wanted to learn. After graduating from college, I moved to New York City, where I lived in strangers’ homes as a dog-sitter for two months before I found my own apartment and job. I wrote on my lunch breaks, and between phone calls at work. I wrote sort of desperately those first few months. Eventually I applied to graduate school, and started at Rutgers University in New Jersey—which I commuted to from Brooklyn, spending two hours on the train each way three days a week. I kept my part-time job in the city, and took on another part-time job as a TA. When I graduated from Rutgers, I had hoped to be in a significantly better place than I had been when I enrolled. Instead, I was literally in the same place: same studio apartment, same underemployment. And then, within that same month, I got a row of rejection letters from various institutions I had applied to, and went through a horribly messy breakup. I sat down with a friend and swore that I would never write again, “At least no more comedies. And I’m never going to write about love again.” My friend nodded. Then he asked me to remind him of that one story I was so obsessed with. By the end of the day, I had the first draft of Bull in a China Shop. Six months later, I was walking down the street with another friend when I got a phone call. It was the artistic director of LCT3, the emerging artist wing of Lincoln Center. He said, “I want to produce your play, what do you think about that?” I said, “I think you’re crazy.” After the play’s success, my mother called me, laughing. “You’re a business now,” she said. For years, my dad has been signing off his Flobeds emails with a joke advisory statement about his product: “your dreams may vary.” But it’s come to mean a lot more than that to us. Your dreams may vary—not only from each other’s but also over time. “Sometimes the dream changes,” my mother says looking back over the last nearly forty years she’s spent with my father, looking at the life they’ve managed to build together by adapting, changing. Where you are, what you’re doing, what the goals are—it can all change. At Flobeds, they have a warrantee called the Goldilocks Guarantee: “Life happens; people change. Your mattress can change with you.” Paying attention, making the right changes for yourself, your family, and your future—that’s what we’re all about in business and in life. the trestle over Pudding Creek would be useable again, when the coast along the mill site would be cleaned and opened for public use, and when we might even have our own local marine science center. After 15 years on council, those dreams have all become realities. Each time I come home, I walk the newly opened South Coast trail, remembering how difficult the process was, how far-fetched it seemed at times. And as the path turns and leads to the Noyo Center, my dad always speeds up, taking me to the container that houses the blue whale bones, excitedly talking about the day they’ll be displayed for all to see. All these years later, and he’s still chasing the whale on the horizon—just like all of us. But remember: your dreams may vary. You’ve shopped high and low, now don’t forget you and your sweet-heart! As the year comes to a close… we count our blessings and hug/write/call our loved ones. Thanks for being part of our FloBeds family. Engineered for Sleep, Designed for Comfort. FloBeds All natural Latex mattress. I am so proud to show you the video Dewey (star) and Paul (camera) put together to showcase our unique latex mattress. Enjoy! As the sun breaks through the redwoods, a world begins to wake up. In Fort Bragg, 120 miles north of San Francisco is an extraordinary California Mattress Company, home of Custom Engineered Talalay Comfort. Earth’s most perfect sleep material. Buoyant Talalay has a breathable cell structure no foam can match. In every FloBed the Talalay inside is surrounded with luxurious 4-way stretch double knit cotton quilted to wool. Inside the cover we first have our convoluted Talalay which provides immediate pressure relief and keeps your blood circulating through your skin. Under the full-width convoluted topper are layers of 3” Talalay, engineered for the comfort and support of each sleeper. Your FloBed is custom engineered Talalay Comfort made to your body’s sleep demographics.Over here we have a Talalay vZone Latex Mattress. Depending on your sleeping needs, your FloBed can be made Deluxe or vZone on both sides, or half Deluxe and half vZone. Side sleepers often have pressure point pain in their Shoulders or Hips… or sometimes their spine aches from bridging those two points. The vZone addresses each zone to provide both targeted pressure relief and spinal alignment. The unique FloBeds vZone allows you to change any zone as your body requires. If your hip is sinking into the mattress too far, simply exchange the Hip and firmer Foot zone, which are sized to be interchangeable. When you change the position of your hip, you adjust your spinal alignment. If your body needs a firmness that is not built in to your vZone, we will send you the Zone you need no charge for the first 100 days. No charge. Nothing to send back. FloBeds adjustability does not end there. With our Goldilocks Guarantee, for the 20 year life of your mattress, you can order zones or complete full length latex cores at a fraction of the cost Years 1-5 a zone is only $25, and up to 2 full length cores for just $75 each. Custom Engineered Talalay Comfort. JUST RIGHT today, JUST RIGHT in 20 years. The Goldilocks Guarantee. Hi, I’m Dave Turner, President of FloBeds. Thanks for watching this video. At FloBeds, we like to say: If you listen to your body, we will listen to you, and together we will get your mattress JUST RIGHT. because, well, otherwise, what’s the point? This Thanksgiving all of us at FloBeds wish you success and joy as you pursue your dreams. We feel lucky to have been given the privilege of your trust to make your mattress “just right”. Let’s all take a moment for thanks; for all we have, and all we can be. We reach out to those who have lost so much this year in storm, fire and war. So, as the days get shorter, take stock. Look back at all you have accomplished and look forward to all you want to achieve. Remember… Your Dreams May Vary.